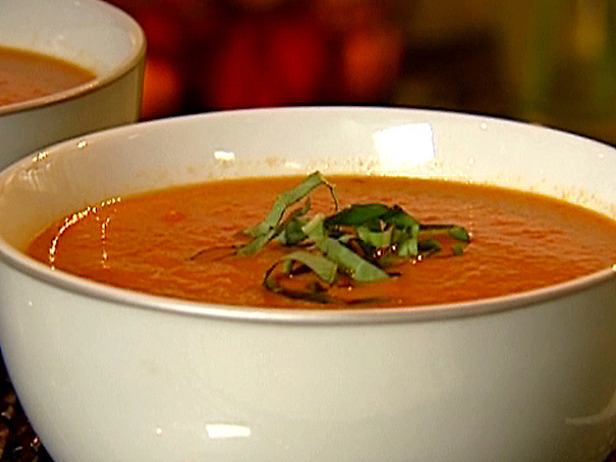 "Slow down the day with a hot, restorative bowl of soup"
fresh garden tomatoes - 2 lbs. Cut off top of garlic bulb; remove any peel that comes away easily. Place garlic in small oven proof dish or wrap in foil and bake 375 for 45 minutes. Let cool enough to handle; squeeze outgarlic flesh into a small bowl. Meanwhile, blanch and peel tomatoes, cut in half and remove seeds (optional). May strain soup at end of cooking process to remove tomato skins and seeds. In a large saucepan heat oil and butter over medium heat; cook onion, hot pepper and carrot for a couple of minutes or until softened and fragrant. Add tomatoes, vegetable stock and garlic. Bring to a boil, stirring well. Reduce heat, cover and simmer 15 minutes. Transfer to a food processor, puree until smooth. Return to saucepan, stir in basil, vinegar, and salt (to taste). While soup is warming, slice garlic clove then. Melt butter in small skilled (do not let burn), add whole, fresh sage leaves and cook until crisped (about 2-3 minutes). Remove with a slotted spoon and add garlic slices to pan, sauté until brown – do not let burn. Ladle soup into bowls and float a crisp sage leaf and 2-3 garlic slices. NOTE: For a creamier soup, add fresh table cream to desired consistency. Garlicky croutons can replace the sage and garlic slices. Soup can be served hot or at room temperature.